Manish Gubhaju joined the team in May 2012 as a Web Developer and very quickly became a very significant force in spearheading our fully integrated website software to become the best and most lucrative on the market at this time. 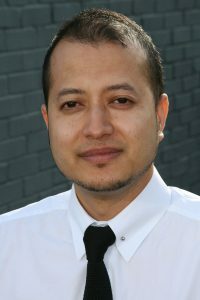 Originally educated in Nepal gaining a first in Computer Sciences followed with a Distinction at Northampton University for MSc IT Services Management. He is capable and confident in all aspects of the fully integrated accounting stock control software & website systems for fast trading companies. Fully responsive design, automatic import of data from the Sharp-aX system, customer configurable design, Quantity breaks, special offers, click & collect, credit & debit card payments, product category lists, size by colour, sales statistics, buy one get one free and many more edgy features. Now heading his team of 5 full time web developers he continues to win the respect & warmth of our customers who in their first years of trading have recognised over £25k per month of new business without in any way affecting their existing turnover. Well done Manish – we are delighted to confirm your well-earned appointment to Head of Web Development and we wish you every success.